Bitcoin users from all over the world have been looking for cheaper alternatives to create additional network nodes. Up until now, the only options were to either use a [previous] computer or laptop, or buy one of the pre-configured – but rather expensive – Bitcoin Node solutions running on a Raspberry Pi. ROKOS v4 might be the solution some people have been looking for, as it will turn any Raspberry Pi into a Bitcoin or altcoin node. Note from the Author: Neither the Author nor TheMerkle.com is responsible for any harm coming to your device or wallet balances as a result of installing this software. Always install new types of software at your own risk. Most Bitcoin community members feel the current plug-and-play Bitcoin Node solutions are far too expensive. Keeping in mind how nearly all of these devices use a cheap Raspberry Pi and some additional storage, the question becomes why these solutions need to cost more than US$100. Surely there must be some alternative solutions available for more tech-savvy people who want to use their Raspberry Pi for the greater good of the Bitcoin network? Various developers and engineers have been thinking along the same lines, and ROKOS v4 is an interesting candidate. The operating system itself is based on Raspbian – a popular Linux version for Raspberry Pi users – and comes pre-packaged with integrated Bitcoin OK clients and Node software ready to be used. It is no secret the Raspberry Pi is a quite powerful device, despite it small form factor. For regular desktop applications, the first generation of devices might be a bit lackluster in performance, but the second generation packs an even bigger punch. ROKOS v4 specifically aimed at Raspberry Pi 2 owners, although it may work with the first generation of devices as well. 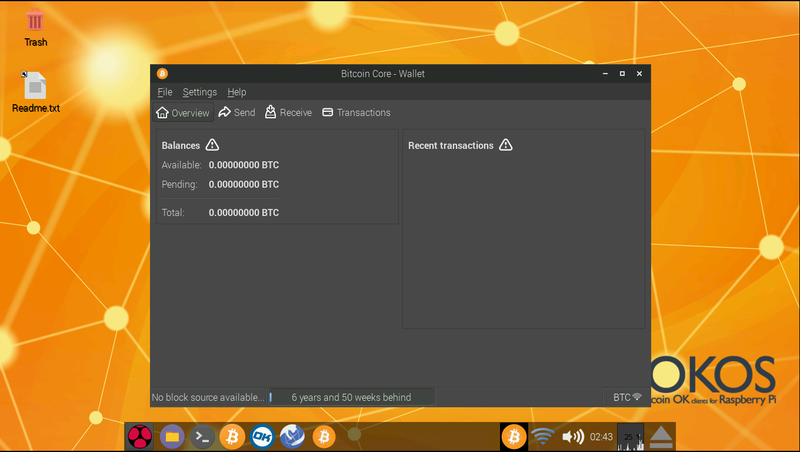 The two main supported applications of ROKOS v4 are either running a full Bitcoin Node or using it as an OKCash staking device. For those of you who are unfamiliar with OKCash, this is an alternative digital currency based on the Bitcoin source code, but with a few twists and turns. Make sure to check out the OKCash thread on Bitcointalk for more information. What makes this free solution so interesting is how it comes pre-loaded with Bitcoin and OKCash clients, which should create a smoother out-of-the-box experience for users. Some synchronization for both clients might be needed during the initial startup, so make sure your Raspberry Pi has some external storage on board more than 50GB. This will not be the final version of the ROKOS operating system, though, as the developers have listed some improvements that will be introduced in future versions. Support for additional digital currencies, blockchain updates, and security updates are just a few of the things that will be coming to ROKOS v5 and beyond.